So far, Cuomo has outlined 14 planks of his 2016 platform, providing an extensive preview of his State of the State and budget address, which he will give on Wednesday in the capital. Still, there are key pieces of his speech that the governor has kept under wraps, including what he has said are top priorities: government ethics, homelessness, and education. It is also unclear what priority, if any, Cuomo will give to policies like the DREAM Act, which he has assured proponents will be in his budget again, but has not given indication of its place in his speech. Advocates are also hopeful that the governor includes a significant paid family leave proposal on Wednesday, and many are watching to see if he unveils a plan for a statewide policy on car-hailing apps, like Uber. While the governor is clearly going big on infrastructure - with plans that could total $100 billion in costs, according to his office - he has promised to lead with ethics as lawmakers continue to fall to corruption convictions, trust in Albany is low, and New Yorkers say Cuomo has not done enough to clean up state government. "Top of my agenda is going to be ethics reform," Cuomo, a Democrat, said Jan. 3 on NY1. "We have done a lot in Albany, but we haven't done enough. And I'm going to push the legislature very hard to adopt more aggressive ethics legislation, more disclosure, more enforcement, etcetera." What exactly this will include is unclear, but good government groups, Attorney General Eric Schneiderman, and many others have put forth recommendations. Chief among these are limiting legislators' outside income and closing the infamous LLC loophole, which allows virtually unlimited campaign donations. Whether Cuomo broaches a public campaign finance system will help gauge how bold he's going on reform. 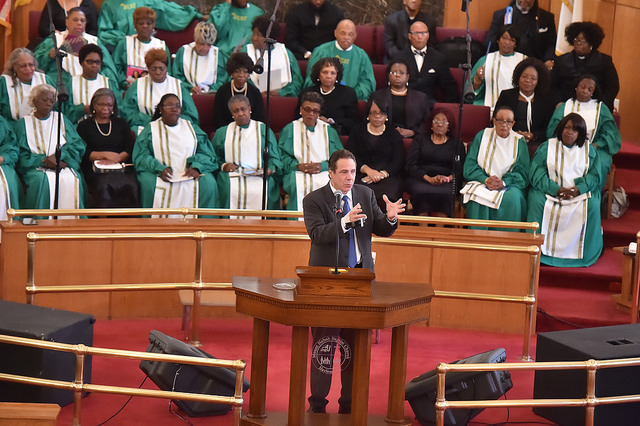 Wherever ethics does fall, that portion of Cuomo's address is likely to be dwarfed by the volume of discussion of the infrastructure plans the governor has outlined and his discussion of economic justice, including his minimum wage crusade. The infrastructure plans, which include a new track on the Long Island Rail Road, a revamped Penn Station, road and bridge upgrades, and more, will be attached to the governor's previously announced projects led by a new Tappan Zee Bridge and LaGuardia Airport. During a Jan. 5 appearance on Long Island, Cuomo said of New Yorkers, "we don't think big anymore. And we don't believe we're capable of doing big anymore. And we don't believe government is a vehicle to do big anymore." But, he promised to resurrect New York's "big" thinking as he announced new plans and referenced ongoing building - all under the banner of this year's tagline: New York State, Built to Lead. "This year in the State of the State we are going to propose the largest construction project program in modern political history in the state of New York," Cuomo promised. "Roads and bridges upstate, airports upstate and downstate, new mass transit, new attractions, new rail transit and new mass transit downstate which is desperately needed. And we are going to do it region by region." While Cuomo has outlined the meat of his building plans, he has not gone into detail on how it will all be funded, though he has promised to do so on Wednesday in his executive budget. Cuomo has called the budget "the most complex piece of legislation we pass," which is true in part because it is a way of doing business in Albany that a good deal of policy is unnecessarily included in budget negotiations. For the governor, whomever it may be, forcing additional policy into the budget is a way of using executive leverage that doesn't exist in post-budget legislative session. For the second straight year, Cuomo is combining his State of the State, which is usually a more policy-focused speech, with the announcement of his budget. A budget deal is due by April 1, whereas the legislative session continues into June. Budget watchdogs are eagerly awaiting the details of Cuomo's spending plans. Nicole Gelinas, of the Manhattan Institute, recently wrote in City and State that "Cuomo evidently did not make an important resolution: stop announcing huge infrastructure projects without a way to pay for them." "The risk in starting lots of new projects without having a way to pay for them," Gelinas wrote, "is that the governor will force the MTA and the rest of the state to scrimp on old stuff that people don't see, like replacing subway tracks and signals." After all the drama that accompanied Cuomo's negotiations with Mayor Bill de Blasio over an MTA capital spending plan, Cuomo may try to steer clear of criticism for his spending plans. As the Citizens Budget Commission points out, Cuomo continues to have billions of dollars to spend from bank settlements with the state. In outlining 12 things to watch for in Cuomo's budget, CBC asks, "How much will the Governor propose to spend for transportation infrastructure? How much will be borrowing versus pay-as-you-go capital, and will a new revenue source be proposed?" Throughout his time as governor, Cuomo has prided himself on reigning in state operational spending, and even while outlining his new plans so far this month, Cuomo has touted his brand of fiscal responsibility. It is unlikely Cuomo will outline an increase in state spending above the two percent cap he has followed. Meanwhile, many, especially from New York City, are watching closely to see what the governor outlines around homelessness, the latest issue on which Cuomo has decided to undermine and supercede de Blasio. Cuomo issued an executive order just after the new year and has promised a robust policy plan in his State of the State. The plan is likely to include more oversight of homeless shelters, which the state is already responsible for, and of operations aimed at reducing homelessness. How much money Cuomo will dedicate to supportive housing, rental subsidies, and other relevant measures is to-be-seen. De Blasio recently announced a major supportive housing plan and, along with advocates and legislators, called on Cuomo to match it (and create a fourth New York/New York supportive housing deal). The governor has not yet made clear his education platform for this year, though he has indicated he will follow recommendations made by the common core task force that he empaneled in September and received a report from in December. Becoming "The Education Governor" has been full of fits and starts for Cuomo. While he has protected and promoted the growth of charter schools, other aspects of his education policy have not gone as planned - these include the rollout of the common core learning standards and tougher teacher evaluations by tying them more closely to the results of student standardized test scores. The task force recommended a revamp of the common core system, more stakeholder input, a reduction in standardized testing, and increased local control over standards and curriculum. The governor's office said that "no new legislation is required to implement the recommendations of the report," so there could be few specific proposals in Cuomo's State of the State. The governor did recently announce he will be investing in the community school model, something de Blasio has expanded vastly in New York City, especially with regard to so-called "failing schools" as he tries to turn them around under the threat of state takeover. Cuomo may take aim at hastening school improvement. On NY1, Cuomo said "many of these failing schools have been failing for over 10 years, believe it or not. And the system, the bureaucracy, has been too tolerant, in my opinion. And we are – we're going to be focusing on the closing schools, we're going to be investing in the school system to make sure we're doing everything we can on the state side." 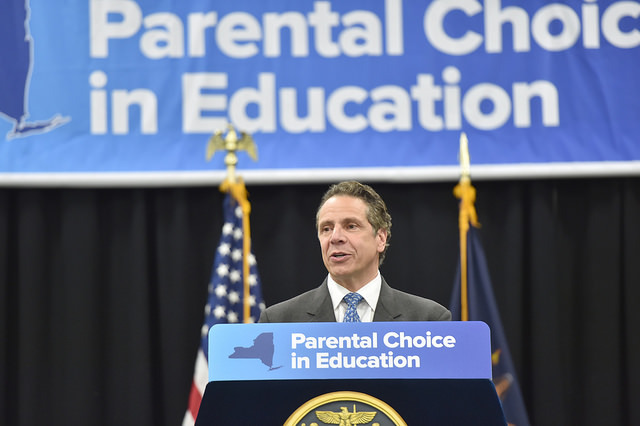 As he has done before, Cuomo also distanced himself from education-related problems: "Education in this state is run by a department called the state education department," Cuomo said. "It is not under the governor. I wish it were, many governors in the past wished it was...It's run by the Board of Regents, which is selected by the legislature, primarily the Assembly." Discussing the common core he said, "We started a new curriculum as part of a national movement called the common core curriculum. And that was rolled out over the past few years; that brought with it a testing regimen on the new curriculum. It was not implemented well. It was rushed. It was confused." Adding that "It created a backlash among parents that frankly shocked everyone," Cuomo mentioned "the opt-out movement, where the parents didn't have the kids take the tests because they didn't like the way it was addressed, they didn't like that the kids were getting lower grades, whatever region." Cuomo said the state education department has to make significant changes "and bring the parents along. Because if the parents don't have trust in the education system, then you have nothing and that's where we are now," Cuomo concluded, setting the stage for next steps by his administration and the state education department, which is doing its own common core review (new SED Commissioner MaryEllen Elia was named to Cuomo's task force, so there appears to be some, if not significant, overlap). While there will almost certainly be sections of Cuomo's speech on education, homelessness, and ethics, the bulk will likely be on infrastructure, economic development and opportunity. He'll showcase these efforts through his push for an eventual $15 per hour minimum wage, a downtown revitalization initiative, tax breaks for small businesses, and the major projects he's outlined. On NY1, Cuomo explained how he sees economic development, saying that "in Upstate New York [it] means basically restoring the economy, and in downstate New York it means growing the future economy – the high tech economy, having the transportation infrastructure to do that – and making sure the economy is working for everyone." He promised to address "very high unemployment among young minority males, black and brown," which he called "just unacceptable," adding, "We have to make special economic initiatives there." To follow that up, Cuomo announced new regulations related to spending on minority- and women-owned businesses. Prior to that, Cuomo also announced "the Empire State Poverty Reduction Initiative," a $25 million program to "bring together state and local government, non-profit and business groups to design and implement coordinated solutions to increase social mobility in ten cities with the highest poverty rates in the state." The governor has promised to continue to fight to raise the age of criminal responsibility in New York from 16 to 18 - New York is one of just two states that automatically treat 16-year-olds as adults in the criminal justice system. Like on several other issues, Cuomo has taken executive action on the issue in the absence of legislation, with a plan to move 16- and 17-year-olds into a separate prison facility from older inmates. Where other social justice issues that, similarly, the governor has backed before but not been able to pass, like the Gender Expression Non-Discrimination Act (GENDA) and the DREAM Act, are featured in Cuomo's remarks is also being watched closely by supporters of those policies. The governor published an op-ed this week detailing the measures he's taken to protect transgender New Yorkers in the absence of GENDA passing the legislature, where it has been blocked by the Republican-controlled Senate. Cuomo did not indicate that he would be pushing GENDA forward in his State of the State. There are also questions around whether Cuomo will include a proposal and dedicated funding for paid family leave, something that de Blasio recently moved on for some city employees and called on the state to pass for all workers. One other policy area the governor has been quiet on leading up to his address, but he could make waves with an announcement on is app-based car services. When de Blasio was battling with Uber last year, Cuomo jumped into the fray to defend the company, where one of his former top aides now works, and say that a statewide policy is needed. Since then, Uber has waged a campaign across the state, getting many public officials on board. Cuomo may surprise people by outlining state policy around Uber and other e-hailing services like Lyft. Tune in at 12:30 p.m. Wednesday for Cuomo's speech - stream online at the governor's website - and see below for the full outline of proposals Cuomo has outlined thus far in 2016. PROPOSAL 1: Restore economic justice by making New York the first state in the nation to enact a $15 minimum wage for all workers. While highlighting this proposal, the Governor announced that the State University of New York will raise the minimum wage for more than 28,000 employees. More information available here; video and other media available here. PROPOSAL 2: Launch a comprehensive plan to transform and expand vital infrastructure downstate and make critical investments in the region. Most notably, the proposal includes a major expansion and improvement project for the Long Island Rail Road between Floral Park and Hicksville. The project will allow the LIRR to increase service, reduce congestion and train delays caused whenever there is an incident along this busy stretch of tracks and will enable the LIRR to run "reverse-peak" trains to allow people to take the LIRR to jobs on Long Island during traditional business hours. By allowing the LIRR to increase service between Floral Park and Hicksville, it will provide a more attractive alternative to driving and thereby reduce traffic on Long Island's major east-west highways, like the L.I.E., Northern State and Southern State, and more trains will make it easier for Long Islanders to reach LaGuardia and Kennedy airports by train. PROPOSAL 3: Bolster New York's legacy of environmental protection. The Governor has proposed allocating $300 million for the State’s Environmental Protection Fund – the highest amount ever for the fund and more than double the fund’s level when the Governor first took office. The Governor also announced two major investments in water infrastructure in Suffolk and Nassau Counties. PROPOSAL 4: Make a series of investments and new initiatives to continue growing the economy and building stronger, more vibrant communities across New York State. These proposals include significant tax relief for small businesses, increased funding to support municipal water infrastructure improvement projects, a new effort to revitalize and transform downtown areas in each region of the state, and a sixth round of the successful Regional Economic Development Council initiative. PROPOSAL 5: Invest in Upstate transportation infrastructure. This includes a plan to offer a tax credit that cuts tolls in half for the New York residents and businesses who utilize the Thruway most often – benefitting nearly one million passenger, business and farm vehicles using E-Z Passes; eliminating tolls for agricultural vehicles; and keeping tolls flat until at least 2020 for all other drivers. More information available here; video available here. PROPOSAL 6: Transform Penn Station and the historic James A. Farley Post Office into a world-class transportation hub. The project, known as the Empire Station Complex, will feature significant passenger improvements, including first-class amenities, natural light, increased train capacity and decreased congestion, and improved signage to dramatically enhance the travel experience. The project – which is anticipated to cost $3 billion – will be expedited by a public-private partnership in order to break ground this year and complete substantial construction within the next three years. More information available here; video and other media available here; conceptual renderings are available here. PROPOSAL 7: Dramatically expand and improve the Jacob K. Javits Convention Center to stimulate the regional economy. The proposal will expand the Javits Center by 1.2 million square feet, resulting in a fivefold increase in meeting and ballroom space, including the largest ballroom in the Northeast. A four-level, 480,000 square foot truck garage capable of housing hundreds of tractor-trailers at one time will also be constructed to improve pedestrian safety and local traffic flow. PROPOSAL 8: Modernize and fundamentally transform the Metropolitan Transportation Authority, dramatically improving the travel experience for millions of New Yorkers and visitors to the metropolitan region. This proposal includes a new approach to rapidly redesign and renew 30 existing subway stations across the system. It also includes a number of technology initiatives to bring the system into the 21st century, including expanding Wi-Fi hotspots, accelerating mobile payments and ticketing to replace the MetroCard, and providing USB ports on subway trains, buses and in stations to allow customers to charge their mobile devices. PROPOSAL 9: Launch a Municipal Consolidation and Efficiency Competition designed to reward local governments that take real steps to make living and working in New York State more affordable. The competition will challenge counties, cities, towns and villages to develop innovative consolidation action plans yielding significant and permanent property tax reductions. The consolidation partnership that proposes and can implement the greatest permanent reduction in property taxes will receive a $20 million award. PROPOSAL 10: Dramatically expand and improve access to high-speed Internet in communities statewide. Lieutenant Governor Kathy Hochul detailed this proposal shortly after the New York State Public Service Commission voted to approve the merger of Time Warner Cable and Charter Communications, which will dramatically improve broadband availability for millions of New Yorkers and lead to more than $1 billion in direct investments and consumer benefits. Additionally, the state issued a $500 million solicitation for private sector partners to join the New NY Broadband Program, which will greatly expand Internet access in all regions of the state, with a focus on unserved and underserved areas. PROPOSAL 11: Launch a $200 million competition to revitalize Upstate airports. The proposal is designed to enhance airports throughout Upstate New York, and promote new opportunities for regional economic development and partnership between the public and private sectors. The Governor made this announcement as he also kicked off the start of renovations that will transform the New York State Fairgrounds site into a premier, multi-use facility. The Governor marked the official start of the historic renovation project with the implosion of the grandstand today. 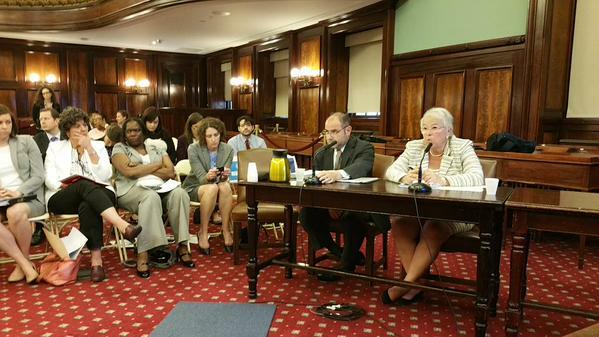 PROPOSAL 12: Combat poverty and reduce rampant inequality through the Empire State Poverty Reduction Initiative. The $25 million program will bring together state and local government, non-profit and business groups to design and implement coordinated solutions to increase social mobility in ten cities with the highest poverty rates in the state. PROPOSAL 13: Launch a "Right Priorities" initiative to further New York’s status as a national leader in criminal justice and re-entry reforms. The Governor's proposal will help at-risk youth find positive opportunities in their communities, while also providing citizens who enter the criminal justice system the opportunity to rehabilitate, return home, and contribute to their communities. PROPOSAL 14: Increase opportunity for minority- and women-owned business enterprises across New York State.